The threat from international terrorism is at its peak and must be terminated. As an elite military pilot you are tasked with locating terrorist splinter cells and, using any means necessary, eradicating them. The future of the free world rests on your shoulders. It won´t be easy, but the military´s most advanced strike helicopters are at your disposal, armed to the teeth with awesome firepower. 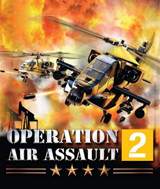 Unleash a huge arsenal of devastating weaponry including homing missiles, rockets, and cannons to undertake hair-raising mercy missions behind enemy lines and rescue innocent civilians.